If you’re like many renters, you may have a contract with your landlord that says you can’t touch the walls of your home. Well, you can touch them of course, but you can’t damage them or—wait for it—paint them! Uhg, bummer! The truth is that many landlords want the walls of the building they own to stay as they are (which, most of the time, is white or pale beige). There is reason for this, since having neutral colors makes the apartment more appealing to a wide variety of tenants, and re-painting a room after a tenant leaves is costly and time consuming. That said, still wondering what to do if your landlord won’t let you paint the walls? They don’t have to just be for your bed. Sheets come in a wide variety of colors and designs, and they make great wall hangings, or with a little extra effort, full wall coverings. You can also use regular fabric, but with this you’ll have to do more measuring and cutting. There are multiple ways you can attach fabric to walls while leaving minimal marks, but double-sided fabric tape often works best. Using furring strips or attaching the sheet edges to strips of wood or cardboard also works, but you still have to attach those strips to the wall using heavy-duty staples or tape (try to avoid using nails at all costs). If you’re willing to take the time to do it right, another method is to starch the fabric on the walls. Wash it and soak it in starch, then stick it on the wall (you may need someone else to help you). The fabric should come cleanly off the wall later on, but you may need to brush some residue off. This won’t color your wall entirely, but they are a functional and unique way of adding color to a dull room. 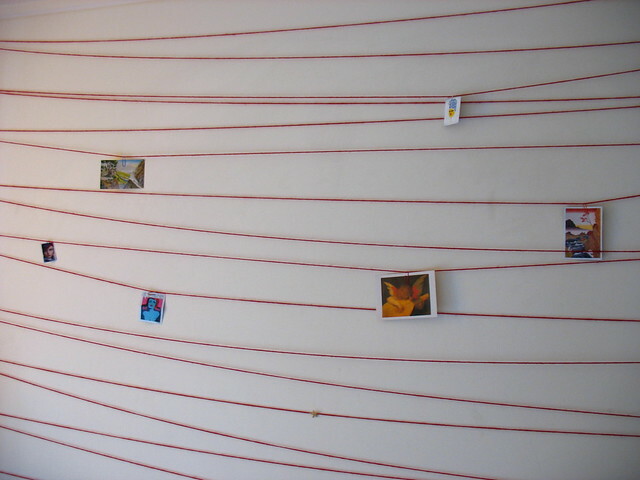 Hang strings/ribbons flat against the wall in horizontal, vertical and/or diagonal patterns. You can even use different colors to create a cool effect, and afterward you can actually attach things like photos and small decorations without putting any more marks on your wall. These have become popular in college dorm rooms, but with so many colors and shapes to choose from, wall decals can fit well into the décor of your home. Because they stick on flat against the wall, decals make it look like cool shapes or designs are painted on the wall when in actuality they peel right off. Just be sure you buy ones for indoor use only that don’t glue on. A large mirror or a series of them in colorful frames can definitely brighten up any room. If you have colorful furniture as well or have used one of the other “coloring” methods on another wall in the room, mirrors will help reflect that and bring that color all around the area. Go for lighter-weight mirrors and frames that you don’t have to use nails to hang them. Murals, tapestries, posters, photos collections and collages… the list goes on and on with stuff you can put on your walls. Oftentimes white or beige walls can actually be a great background for large art pieces, as this way all focus is drawn to the colors in the artwork, not the wall. Whatever you do though, don’t put too many different types of things all together. This just looks more crowded and tacky rather than nicely colorful. Keep in mind that when you attach things to walls, even the most gentle materials can sometimes leave marks. When you know you’re moving out, take down all wall hangings first before packing anything else up. Ideally, this should be over a week before you move, if not longer. Examine the wall for any marks or holes that your wall hangings may have caused, and get some paint that matches the wall in order to patch it up. If anything is deep, you may need to get some putty as well to fill it in before you paint over it. If you leave any marks or holes as they are, your landlord may charge you for damage and repairs, and this could cost you more than fixing it yourself. If you’re still looking for that new home, check out RentFinder’s search tool today.